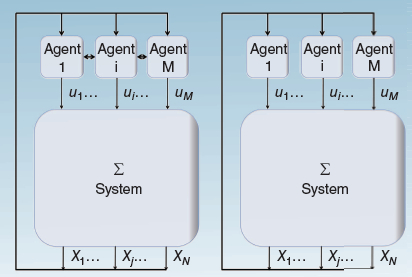 Abstract: This is a position article on the current state of the art in distributed Model Predictive Control (MPC) and our view on its future potential. We present results from a recent survey of 35 distributed MPC approaches. For this, we propose a way in which distributed MPC approaches can be categorized for comparison. We also link the potential that these approaches have to the domain of other fields such as integrated environmental optimal decision making and cyber-physical systems. Many challenges for realizing these links have to be faced. We present our views on how the advances in several highly active research domains could be used to overcome these challenges. As such, this article is intended as a starting point for the exploration of various novel research cooperations. Reference: R.R. Negenborn, J.M. Maestre. Distributed model predictive control -- An overview and roadmap of future research opportunities. IEEE Control Systems Magazine, vol. 34, no. 4, pp. 87-97, August 2014.